Fun Times at Children's Classic! Raising Generations of Ogden Children! In 1964, Michael and Lucy Morrelli founded the first Children’s Classic Childcare center, formerly known as Children’s World, in a humble 3-bedroom duplex. The small center grew to a 30 children capacity with a large waiting list. In 1965, Children’s Classic was built next door with a licensed capacity of 100 children. 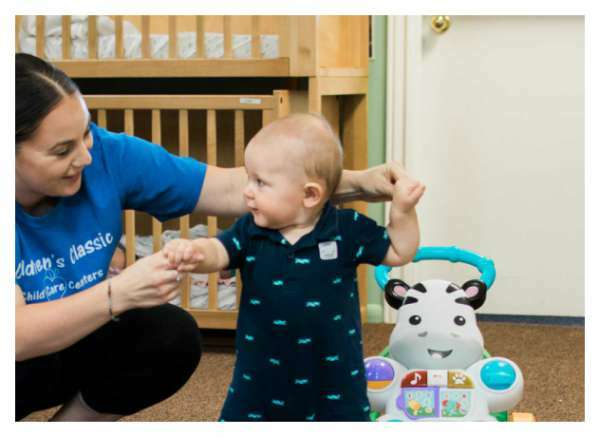 Children’s Classic became a prominent childcare center in Ogden. After several years of success, the second school was built in South Ogden in 1982. In 1989, the center formerly known as Children’s World formed a non-profit corporation now known as Children’s Classic. This would ensure grant funding and opportunities to update and improve the facilities. Throughout the years Children’s Classic has offered quality child care services. We feature the kinds of enriching activities that help children learn and explore their world in a safe nurturing place. We offer care for infants through grade school children. We have a preschool program, as well as full day child care. For school-age children we transport to select public schools nearby. We also have a full-day Kindergarten. 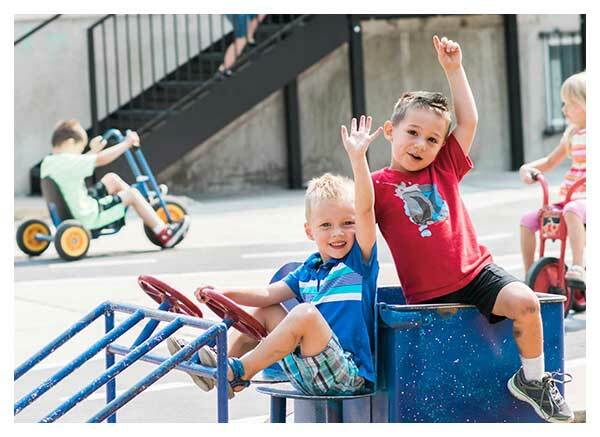 The enriching activities we offer the children include: art, music & movement, math, simple science, and small & large motor development. The children are served breakfast, lunch & snack. To learn more, click on Our Programs. While other centers seek out competent help, Children's Classic seeks out individuals who truly love working with children and want to transform that love into a career. We're staffed by true career professionals. We have 25 employees who have each worked for us for 5 years or more! Our formula is simple. We show love and appreciation to our team members by giving them training, opportunity and above-industry compensation and benefits. That investment is reflected their devotion and dedication to caring for your children. I have been with Children’s Classic since 1979 and I have been the administrator for over 25 wonderful years! I would like to be the first to welcome you to our Children’s Classic Childcare centers here in beautiful Ogden. We are happy to say it’s been 50+ years and we are still loving, caring for and teaching children. Kara attended Children’s Classic as a child before she began her career here in 1991. Kara loves knowing her own children have been able to grow up in the same loving environment. Kara received her Child Care Professional Credential in 1996. She earned her Special Needs Endorsement and was awarded the Caring Heart Award from the State of Utah for her dedication to children. Justina Longman attended Children’s Classic when she was young. Then in 1981, she began working for the center. She attended Weber State College for two years and received her Child Development Associate Credential. She has also received a Directors Endorsement, an Infant/Toddler Endorsement and a Caring Heart Award. Family owned & operated for over 50 yrs. Longevity of staff-We have 25 staff who have been employed with Children’s Classic 5 yrs. or more. In class camera’s-Gives parents a piece of mind leaving their children. Secured key pad entrance-A code is required to enter & exit building keeping your child safe. We received 100% on our Health Inspection. Top Star Rated-gives us the training to help target obesity in preschools. Private all day Kindergarten-small class sizes, fun stem activities, small reading groups and much more. Letter People Phonics Program- introducing phonics to children in a whole new way. I absolutely ADORE this school. Every teacher and employee is so helpful and friendly. My little has been coming here for just over 2 years and she loves it. It is very safe with coded entry and exit. I would definitely recommend this school. I've been bringing my kids here since my oldest was 3 which was 10 years ago. All of my kids started preschool here I absolutely love this place . Justina has been here since before my kids started and she works so hard to run an amazing place well organized place. My children love coming here and have bonded with every teacher they have had. All of the teachers are wonderful! I would recommend this place hands down to everyone looking for a great daycare . I've already have referred so many. I attended Children's Classic as a child and loved it. It felt like home to me and the teachers felt like family. Now, I take my child there once a week and know he is in good hands. The staff is loving, kind and I know they love my child. That is the most important thing to me as a parent, to know my child is loved while I am away. This is a family owned and run business. Many of the staff have been there for years, some were even my teachers when I was there more than 20 years ago. You know they love what they do and love the kids. I truly feel like I am leaving my child with family, it doesn't get better than that! Tomorrow is a bitter sweet day for our family as it marks my daughter's last day at preschool. Children's Classic has been a wonderful experience for her. Each and every one of the teachers and staff always showed my daughter nothing but love. Miss Seeta is an amazing teacher and it shows how much she loves her kids. Thank you to everyone for taking such wonderful care of my baby girl. We will miss you all! Didn't want to let my baby boys go for anything but I was told about children's classic by a friend and decided to try it out. We have been to both centers and they are both are amazing. The staff is great and the facilities are perfect for the kiddos! I won't take my kiddos anywhere else and they will remain here until we must leave. If you are looking at other places don't.... your search ends here, I promise! Children's classic has been an amazing Daycare for my children. When we were looking at a daycare for our children it was the hardest decision, trying to figure out where you want to leave your kids with strangers, and have a piece of mind that they are safe. We went to Children's Classic for a tour and from the minute we walked in to the minute we left it was an amazing feeling... I could not ask for a better Daycare than Children's Classic. Not only have they taken on our crazy schedule, but they work with me when I have a bump In my road. All of the teachers are truly amazing. They (my boys) do so many fun activities and are learning so much since attending Children's Classic. I love to see what they bring home each day... I even went to Children's Classic when I was a boy, they are the tried and true Daycare/School for kids. Thank you all so very much! We look forward to Kindergarten here! My daughter loves going to school here! The teachers and staff there are all so great with her, I never have to worry about her when she's in their care! I was a stay at home mom for 20 years. Anti-daycare. I swear to you if I knew this kind of care was avaliable I would have snatched it up. I have to work now. My youngest has been here for a year and a half. I would absolutly recommend this childcare. My daughter goes to the South Ogden location and she loves it. She hadn't been in day care for a while and so her first few months there were hard. Now she loves it! She loves her wonderful teachers and all of her little friends. She has really come out of her shell and has become quite the sociable kid. I love this center and all of the great staff who welcome me and my daughter everyday. I love this daycare. And that is TRULY saying something coming from me. I'm sure that most other parents get really crazy when it comes to their child's caregiver, but with all my anxiety, I'm the craziest of all!! These guys started watching my baby when he was 4 months old. That killed me! It was so hard to leave him but I only worried for that first day, and after that I knew he was in good hands. They monitor and track everything! Every feeding, diaper, scrape, and accomplishment. My son been at this center for 3 years and has been an AMAZING experience. We love the staffs, they are very professional and super nice. They accommodate each child and make the kiddos feel very comfortable to have a great day but especially for parents to leave with no worries. I definitely recommend this GREAT center to everyone. I have been with Children's Classic for now 20+ years. That is a looooong time! But, that also tells a story! Started with my son that is now 22 years old, daughter 20 and then my son that is now 16. I was so excited when I no longer had to pay child care after my last son completed kindergarten. Then surprise!! I now have a 6 year old that is now in their Kindergarten program and has been with the center since she was 3 months old! My girls have each attended Children's Classic since they were 3 months old. Now in Kindergarten and Pre-K, they have built relationships with teachers and other students there that have helped further develop their social skills in other environments. I absolutely adore the staff at Children's Classic and I know that they they teach, love and protect my children and truly care about their development. I don't know what I would do without this place and it's amazing teachers and staff. It was hard when I first started taking my son to daycare but knowing that he is loved and taken care of while I am at work has been a great blessing. Some of his teacher feel like family to us and I know that they love him so much. Plus he is learning so much and developing great friendships with his peers. I couldn't ask for more!